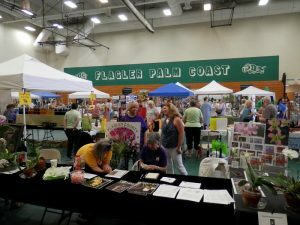 Latest News | The Garden Club at Palm Coast | "Come grow with us"
On April 13, 2019, the Garden Club at Palm Coast held its annual Spring Festival at the Flagler Palm Coast High School. The Festival was again bigger than the previous edition and many visitors were welcomed. 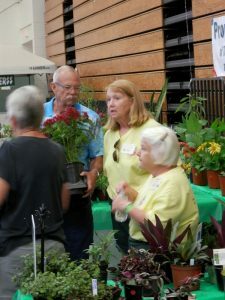 Important component of the festival is the Plant Sale. The Propagation Guild produced more than 600 plants and another 600 were purchased from growers. 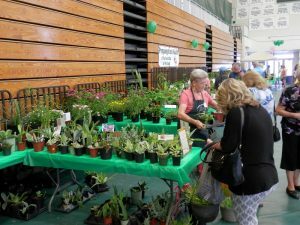 A wide variety of plants was available for purchase. A warm thank you to the many club members who contributed in any way or form to the success of the Festival. Also a big thank you to the sponsors who donated to the Festival. Another big thank you to the many vendors who participated in the event. See you all at the Spring festival 2020. Hear Ye! Hear Ye! 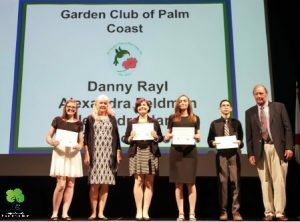 The Garden Club at Palm Coast is awarding two scholarships this year in the amount of $1,000 each. The Scholarship Ceremony will be held at the Flagler Auditorium on Thursday, April 18, 2019 at 6:00pm. You are invited to attend. 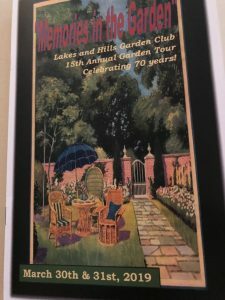 The official presentation of the checks will be at our annual picnic scheduled for May 13, 2019, at Herschel King Park. Monday, April 15, 2019, is our next Monthly General Meeting. NOT April 8th. The meeting was moved one week forward to avoid conflict with the FFGC Convention in St Augustine April 7-9. Members are encouraged to attend the convention. We are looking forward to seeing you all on April 15th at our next Club meeting. Guest Speaker: Erin E. Alvarez (Lecturer), UF/IFAS Environmental Horticulture. She will present “Propagating Pollinator Habitats”. 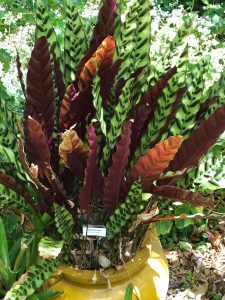 Description: Most of our food and ornamental plants rely on some kind of critter to get the next generation going. Gardeners can help pollinators like bees, butterflies, beetles, birds, bats, and more in a myriad of ways that can be adapted to any kind of garden or landscape. Registration and the Plant Sale start at 12:30 pm and the meeting kicks off at 1:00 pm. 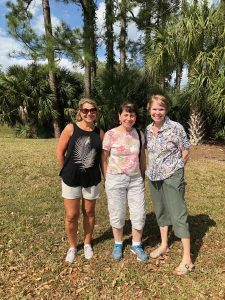 On Sunday March 31st Carol Geran, Rosie Byard and Nancy Iandoli went on a field trip to Mount Dora to attend the 15 Annual Garden tour of 5 beautiful homes and gardens. Garden #1 had Bamboo Orchid, RattleSnake plant, a Spinach Tree and a waterfall rock garden in pool area. 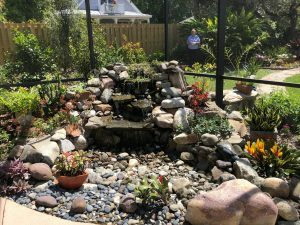 Garden #2 had a large Shrimp plant, a purple hanging Orchid and a Star Burst plant as well as milkweed, sage, begonias to offer food for butterflies and hummingbirds. Garden #3 The focal point of this yard was the slope that had a waterfall and river bed to attract birds and wildlife. 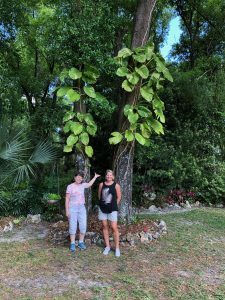 There were two tall Philodendron plants climbing up two big trees. 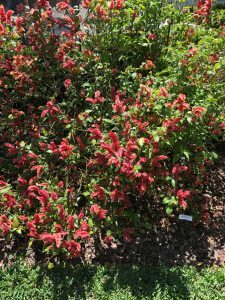 There was a variety of flowering shrubs and perennials. Garden#4. 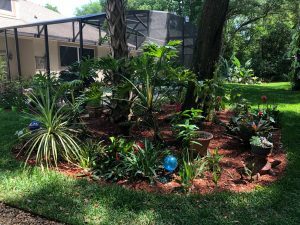 This yard was once an abandoned property and brought back to life with flowering shrubs and trees. 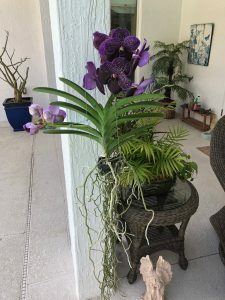 Beautiful pottery is filled with Bougainvillea and other ornamentals to add color as well as favorite greens and herbs close to the back door for easy picking. 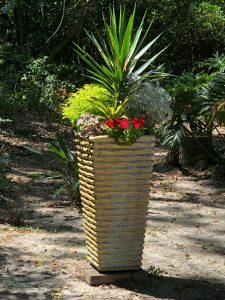 Metal structures blend in with plantings to create a tropical garden. 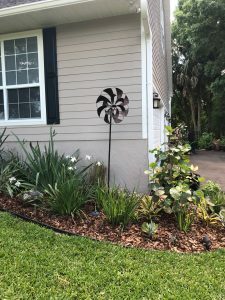 Garden#5 has metal structures as well and wind chimes. 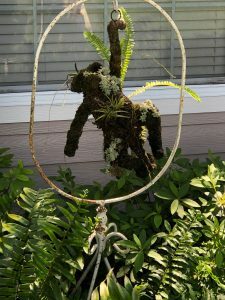 There is a hanging monkey made of plant material, perhaps moss. 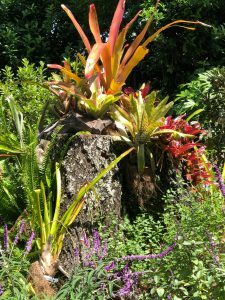 The backyard has a large tree stump that has several Bromeliads and other plants attached to the tree. This yard is certified by the National Wildlife Foundation as a Wildlife Habitat and Monarch Way Station. 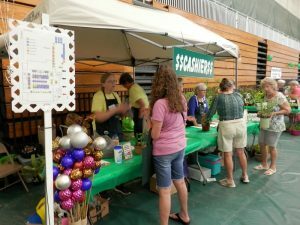 This weekend the Garden Club of St. Augustine presents the annual Flower & Garden Expo on Saturday and Sunday, March 30 and 31, 2019. The event is sponsored by EPIC Behavioral Healthcare. In addition to her entertaining leadership at the club meetings our President Sue Bara also has an artistic side. She is very creative with flowers. 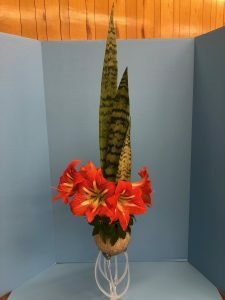 She won the Blue Ribbon for her entry in the Flower Show Arrangers competition. See the photo of Sue’s creation. 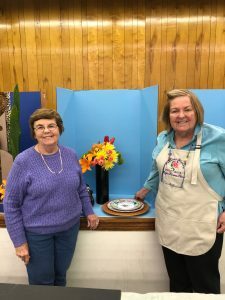 Sue was the only representative of our Arranger’s Guild in this Flower Show. 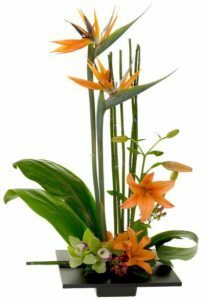 Become an Amazing Floral Designer! 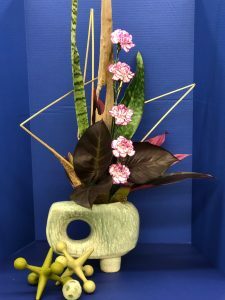 This Floral Design Study is a nine unit series with the goal of developing an understanding of the art of flower arranging for both the home and for flower shows. 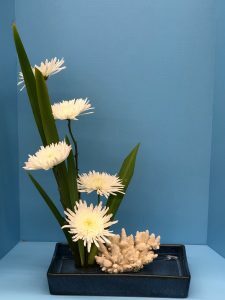 It is a two-part series consisting of six classes covering basic floral design followed by three more advanced units which focus on creative floral design. 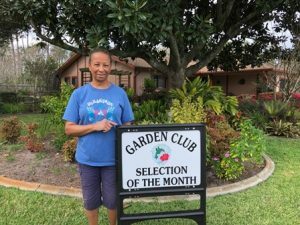 Fay Davey of Pepperdine Drive has been recognized as April 2019 Selection of the Month by The Garden Club at Palm Coast. Ms. Davey moved to Palm Coast in 1985 from New Jersey. 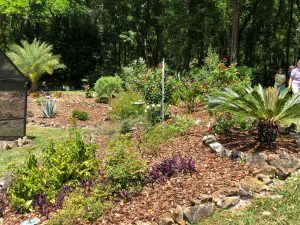 This yard is on a corner lot and has several islands of Azaleas and Bromeliads which Fay has propagated and planted throughout the landscape. 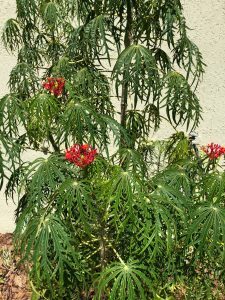 The front door area has a large potted Red Crown of Thorns, a water lily in a small pond, a night blooming white Jasmine, several Bromeliads and pink and white Vincas. 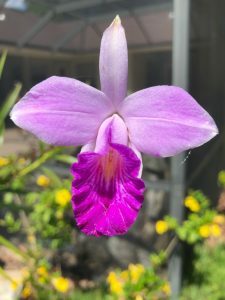 The garage area has a beautiful Yesterday Today and Tomorrow bush with its deep purple, white and light purple flowers that are very fragrant. On the other side of the garage Ms. Davey has an orange Chinese Hat plant. 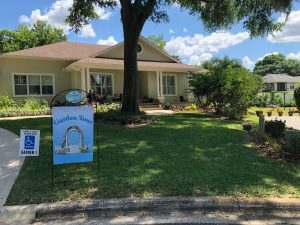 The front yard is loaded with pink, white and red Azaleas, white Pentas, many varieties of beautiful Camellia bushes in red, white and pink that are simply breath taking throughout the front and back yard. There are pink, white and purple Crape Myrtles and red berry Nandina (Heavenly Bamboo) bushes. 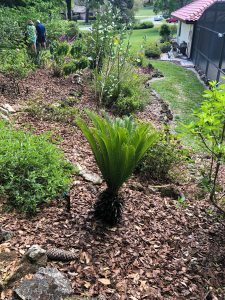 The island along the side area has yellow flowering Japonica, Tassel fern, many Bromeliads. 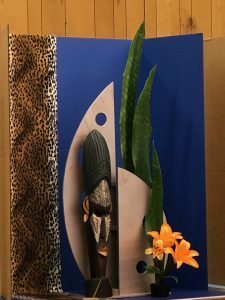 The middle island that has two Crane statues grazing on its bounty of various Bromeliads, pink Gladiolus, Azaleas, and a Copper Plant with its vibrant foliage. 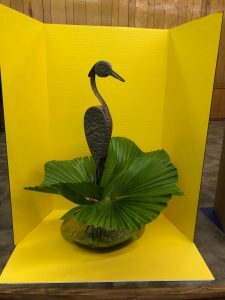 There is a Pagoda among yellow Bush Daises and lilies. There is a trellis with Sweet Autumn Clematis Vine with white flowers and a huge Magnolia tree. The back yard has numerous pink, white and red Camellias, pink roses and a Wisteria vine growing on a pergola. Walking along the right side as you exit the back there are walking stones engraved with flower designs and you have a white Hydrangea, a Brazilian golden Butterfly vine, Crotons, Begonias, and a beautiful white Camellia bush. In the patio there are several gorgeous bright orange and yellow orchids waiting to be moved out into the yard once the weather is warmer. There are four rain barrels that are used to water all her potted plants and conserve water. You can always find Ms. Davey working in her yard planting, transplanting, weeding and watering. 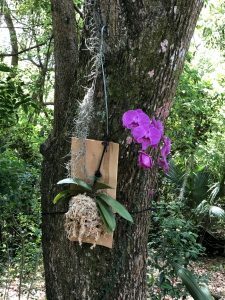 FFGC and UF will present the annual Short Course “Bees, Butterflies and Blooms” in Gainesville from June 9th till 11th. 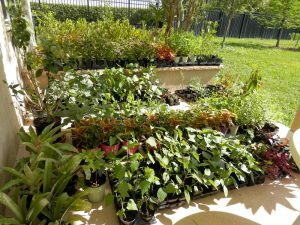 The conference will conclude with opportunities to purchase plants and wildflowers that can be transplanted into your home landscapes. Penny Decker was the Arrangers Guild Unit #5 Arranger’s Class instructor on March 19th. She showed appropriate use of a base and coordinating it with the container. 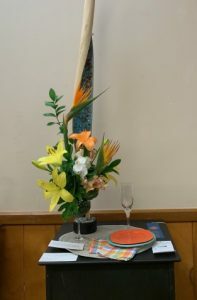 Penny made several arrangements demonstrating featuring the difference between a featured object and an accessory, and leaf manipulation. 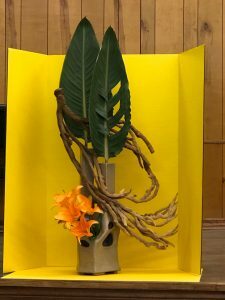 She discussed the importance of balance and rhythm in a floral design. Arrangement by Nancy. 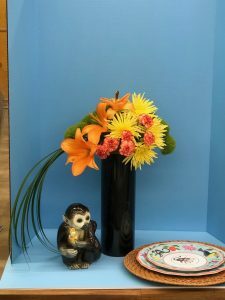 She bought this unique vase at Treasures in the Attic for …….$5.00! Based on the morning instruction, twelve of the class participants then created their own arrangements which Penny critiqued. 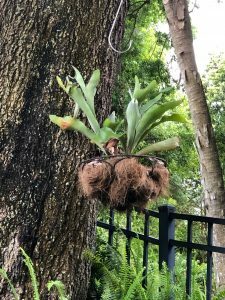 The Flagler County Orchid Society is demonstrating dividing & re-potting Orchids Tuesday, March 26th in the Flagler County Art League, Room A209, City Marketplace, 160 Cypress Point Pkwy, Palm Coast at 7:00 pm.